Once you’ve settled on a contractor and they’ve put together a plan, it is vital that you lock down those plans. This is the time to make any adjustments to what you want. It is also the time to work out the payment and progress schedules. You also need to establish how changes will be made in terms of expenditures that go beyond the budget. All of this should be spelled out in a written contract. If there are changes in that contract as the project progresses, then those should be written out as well. If you live within the confines of a homeowners association, then you can expect there will be restrictions on when work crews can actually work. You can count on any deviation of those rules being reported on by your neighbors. No matter how much you strive to keep your project on budget, there are always overruns for unforeseen expenses. This is especially true if weather plays a factor that can cause delays. It’s a good idea to set aside 10% of your project’s budget for contingencies. Best-case scenario: You won’t have to spend any of that money. Overnight you’re going to have a group of strangers coming into your house and creating all kinds of mess and noise. It is important that you establish boundaries for the crew. Will they be using one of your bathrooms or will there be a portable toilet outside? What about smoking or playing music? What areas of the house are off limits? 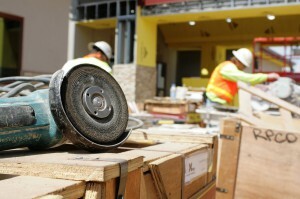 All of these issues should be spelled out with your contractor who will relay them to the crew. You need to prepare a backup plan for whatever disruptions you’re taking on. For instance, if you’re having your kitchen remodeled, then you need to set up a backup kitchen in another room. A microwave, toaster oven, coffee maker and mini fridge can be set up in a dining room or guest room. You might have to depend on a lot of crock-pot recipes and paper plates for the duration. Your remodeling project is going to generate a lot of trash starting on the first day when the demolition occurs. You can take charge of the cleanup by setting up a debris removal session with Junk Works. These are the professional junk haulers who have a lot of experience around all kinds of construction sites. It might also help to schedule another session with Junk Works at the end of the project for a final cleanup. Bringing Junk Works onto your remodel project will help minimize the debris pile up. Lock them down today. This entry was posted in Construction Waste and tagged debris, junk works, remodel on April 30, 2018 by Junk King. Last updated April 30, 2018 .